Does anyone know if the opensource firmware is compatible with the stock 8pin vlcd5 display? No it is not. There are features that would be impossible to have, like configuring the battery max current value or even battery low voltage, etc on the LCD. The OpenSource firmware needs KT-LCD3 and the tools needed to install the firmware on the TSDZ2 motor controller are the same to install the LCD3 firmware. Thank you Casainho. I found the lcd3 display on ebay, and I think there is a 20% off coupon today too. If I order the kt-lcd3 display (24/36/48v) I guess I would need to get a new throttle too? Does the stock throttle connect to the lcd3 display or would I need to get a different throttle with a different connector, or does it need to be connected directly to the controller? I broke the thumb lever off my throttle recently so I need to order a new one anyway. I think I can order everything today, including a 3rd battery so I will be able to test a 15s2p 56v battery with it once all the parts arrive. I assume the display hooks up to the stock display connector? If I order the kt-lcd3 display (24/36/48v) I guess I would need to get a new throttle too? Does the stock throttle connect to the lcd3 display or would I need to get a different throttle with a different connector. Perhaps it uses the bafang throttle? Well, will work with stock throttle for sure since throttle do not connects to LCD but instead directly to the wires from the cable that comes from the motor controller. You know, you will need to wire the throttle and the LCD3 by yourself. Throttle, the ones I know that are cheap from China, usually have 3 pins: 5V; GND; throttle signal output --- and this 3 wires need to be connected/wired to the the cable that comes from the motor controller. And I am right now implementing on the firmware the sending of information from the motor controller to LCD3, that includes the raw values that are read from the throttle, torque sensor, PWM duty_cycle, motor speed in ERPS, etc. In this case, it can be nice to look on LCD3 and see the value of throttle and easily see it working or not -- it is nice for debug, when for some reason the throttle do not works. Thank you Casainho! 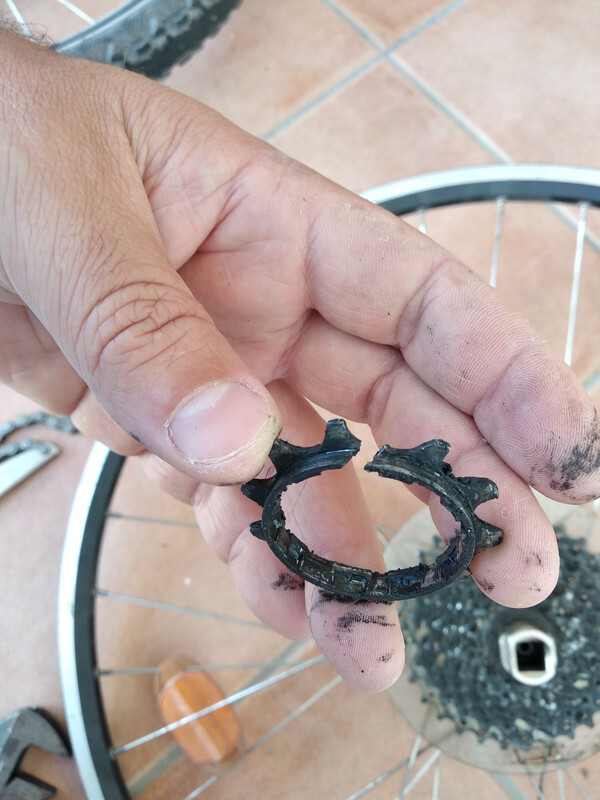 I'm sorry about the sprocket, it has probably been happening for a while. All your features are nice but what I really like is ease of programming and voltage and amp settings. I guess I have to cut off the motor to lcd connector and wire in a new one, and also hard wire the throttle into the motor wires as well. I am guessing it is not too difficult, provided I don't have to solder them I think I will reduce my amp output though. I think when the battery is pushing 60v 15 amps is probably more than enough power. I am lucky that I hardly ever use that 11 cog, I only use it when going over 30mph down hill. FYI, if anyone needs to order parts Ebay has a coupon today ($25 off $119 order code PRIMO119). Also topcashback is offering 2.5% cb on ebay purchases today, so almost 23% off. I have a noise problem with my Tsdz2. As you can see the noise is only active when the motor is. I have taken apart the motor gears (blue one) and bearings and see no damage or tear on any part. Regreased it with Mobile28 grease. After a few 100 meters. The sound is still there. That sounds horrible! It has to be in the reduction drive somewhere. Did you check the final reduction on the drive side? There are features that would be impossible to have, like configuring the battery max current value or even battery low voltage, etc on the LCD. The OpenSource firmware needs KT-LCD3 and the tools needed to install the firmware on the TSDZ2 motor controller are the same to install the LCD3 firmware. Oh, I do not know you could configure the battery voltage and amp settings directly on the lcd (after you flash the firmware to use the new software), I thought you had to run a program on a computer and upload the settings in the firmware. That is very cool dude, that alone is worth getting the new lcd. Casainho, if the github wiki is taking over from your other web pages can you please add a link in your signature ? But anyway, I added now to my signature. Please be careful, revise every wiring 3 times to make sure you don't do any mistake. Really happy to see you joining - your youtube videos about TSDZ2 are a reference for me!! Maybe you could write a wiki page about the repairs and adding your videos. Please first test original improved firmware + LCD3 firmware version for that motor firmware version. Don't start testing the OpenSource firmware, first try original improved. After, you will have the hardware and software tools ready to jump to the OpenSource firmware. I read today TSDZ2_wiki on GitHub, for the first time, and I believe that´s what was missing for all TSDZ2 users. Very good TSDZ2 Wiki. I hope many people contribute for this Wiki. I won't be using brakes or throttle. My first goal is to use my 36v motor at 60v. I will install the lcd3 with it's new firmware then flash the original improved firmware to the controller then flash the eeprom with 52v nominal voltage ? Correct ? Also I'm using a booster to boost from 42v to 60v. Unfortunately this booster is constant voltage so I can't rely on the lcd3 to monitor the battery but I can use the mah count on the lcd and manually reset it when I recharge yes? Does it indicate also Total km (ODO) and trip km? In order to set up the motor with modified firmware (wheel diameter setting, motor current, number of mgnets ecc.) there is a manual? Or as alternative where i can find some informations? I have not heard anyone do this yet. It is very interesting. Running the motor at a constant voltage sounds appealing though since you won't have all the cadence fade over time. Is the booster efficient or does it waste energy? I also miss them but I didn't implement them yet. But now that wheel perimeter is setup by user, I think we should get a very good calculation of ODO and trip kms. I think I now have all the resources in place to implement that features and should not be hard. - ODO is a value that is always incremented and is saved on EEPROM memory before shutoff the LCD3. On configurations menu we should be able to reset that value and even maybe setup a custom value(??). - trip kms maybe I should consider to reset this value every time LCD3 shutoff... any other idea?? And thanks for the feedback!! LCD3 back side says it is a 24-36-48V but I just tested with 62.2V with a lab power supply (3 minutes testing only) and it works. Right, that is the sequence. Maybe I should send the battery voltage from the motor controller to LCD3 and use that value, unlike now that I read the voltage on LCD3. I dont think he is talking of running the motor at a fixed voltage.. I suspect he is doing this.. Thank you hillhater, i think i will avoid that. now what might be nice is something small and simple that could limit the voltage to a certain amount (say 60). example: 15s battery fully charged at 63v would only output 60v until it goes under that amount, and then the battery would feed the motor directly. or even a 16s battery at 67v max charge current. this would raise the voltage throughout the range and keep the cadence limit up high. If I could count some time, let's say LCD3 keeps counting time before really shutoff, would that be better to put like 2h of interval?? I implemented a new configuration submenu (number 2) that just shows some data from the motor controller, like the raw ADC value of throttle and torque sensor, motor speed in ERPS, etc. This information can be valuable when installing the TSDZ2 and verify that throttle is working ok or not, torque sensor, etc (yeah, I received a TSDZ2 motor with a not working torque sensor that would always give 0 value). Please see the video with legends (this was my first time adding legends to my videos and seems a great tool!). Can you guys look at the end of the video and tell if it is normal that my motor swings that way when I accelerate?? I think my bolts are all thigh and I even used loctite. I know my motor does not move but I did not use the rear bolt on mount since I have nothing to bolt it too. I wrapped my motor with a crisscrossed heavy duty cable tie around the bb and it does not budge at all. 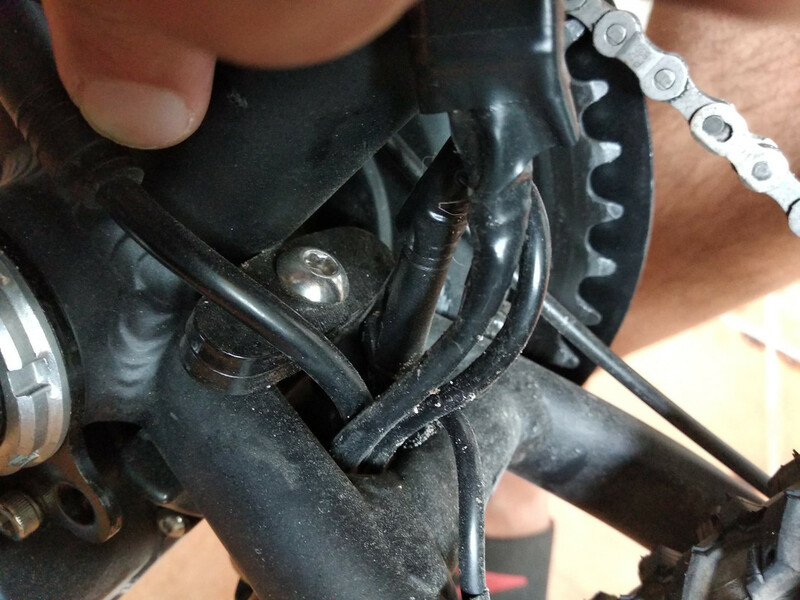 Perhaps there is some play with the hole in the metal piece which the bolt slides through or maybe is shifting on the frame? Your motor sounds quite different than mine too, I guess it is due to your metal gear. That was I put 2 of that metal parts on my oat recent ebike of my son, I had another spare part from a dead motor. Guess I will have to found locally a stronger piece of metal than the stock one. Can you please share a picture of your setup?? My TSDZ2 java code "control centre" . All functions are implemented. It was running on my laptop + arduino. My purpose was with it to understand the communication between motor controller and LCD. Now as I've learnt it I'll try to demonstrate it to you as well. I was surprised that the 6Km/h mode works with this, as with the XH-18 LCD it was not. Sorry the pictures are not the greatest as much of it is hidden from view. What you want to do is use a heavy duty cable tie to snug the motor up against whatever you are using for support. I had nowhere to snug it to so I had to crisscross the bb and use that as the leverage point and then snug the motor portion of the mount up against the backside of the bb. 650 miles so far and as far as I know it hasn't budged at all. Use a thread lock and check the fixing of bolts more often. I missed this moment and the body broke in half.